Marianne’s cook Jim fed us a cowpoke’s breakfast of scrambled eggs, bacon, and flap jacks, I burned another cup of fuel defrosting the windshield and the cab, then the real work began. 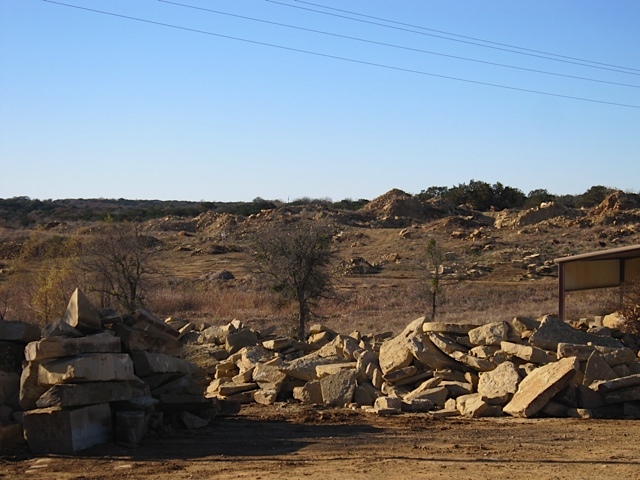 First stop, Lueders, Texas, population 264, on the banks of the Brazos River, and nestled into the Lueders basin, source of some of the most sought after limestone in Texas. The quarrymen of Lueders, like the coal miners on the Navajo Nation and the oilmen in Snyder, are commoditizing natural resources formed and sequestered tens of millions of years ago. Lueders limestone is twenty to thirty million years old. I learned that the color variation is a result of water-born minerals leaching down into fissures in the rock. Bulk limestone sells for $60 per ton, raw coal about $150 per ton, and crude oil about $710 per ton. We visited four different quarries all within four miles of each other. 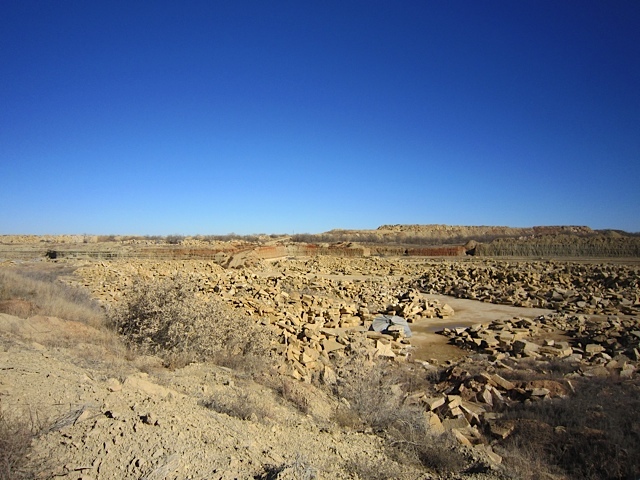 Lueders LImestone, Mezger Enterprises, Continental Quarries, and Aguado Stone. Believe it or not, this was my first visit ever to a stone quarry. They’re quite different from an aggregate quarry. I’ve seen hundreds of period photos of quarrying stone - men with hand drills and long levers; rope winches and wooden derricks. All very romantic, even serene. Not quite the case in the Lueder’s basin. Except that the limestone was white, I could have been in an open pit coal mine. Fifty foot deep hole in the ground the size of ten WalMart parking lots; overburden piles lining the sides, broken down equipment, mud from the recent weather, and, I imagine, worse dust when the rains pass. The buildings where the twenty-ton blocks were cut into slabs were corrugated metal on steel frames, the doorways and side walls ripped and rendered from years of erratic loader operators or unloosed monoliths. Muddy water from cooling the eight-foot in diameter diamond tipped saw blades covered the floors, or what passed as floors. What these quarries all had in common is that they were far away from civilization, and it is unlikely many architects would go there to look for product. They were sprawling and seemed to have grown without a plan. The waste piles dominated and the slurry (pond cake) piles were always in the way. They do have the electricity and water one of our plants would need, but I didn’t see a potential for “beautiful synergy” or an opportunity for those visual images that would elicit the stone stewards protecting the land. Nor did the men we met, the superintendents. Their job was simply to get the stone out of the ground and either shipped in bulk to finishing plants, or chopped into facing stone and stacked onto pallets. It seemed like their biggest concern was keeping the equipment running. As Doug Walker said to me, “rock is hard on equipment”. 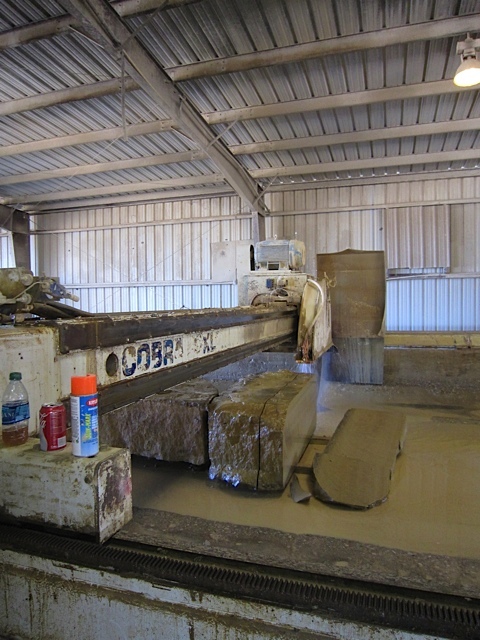 Done in Lueders, we headed south to Austin and a look at the shops where the limestone is made finer.